The president of the European commission, José Manuel Barroso, will tomorrow launch a prototype electric car that folds up to take up less parking space. 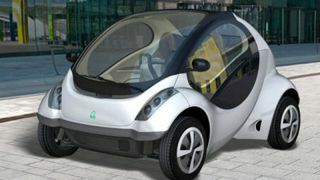 The little two-seat vehicle is called Hiriko and is the product of a partnership between Basque businesses, Spanish government and the US's MIT Media Lab. The folding mechanism pulls the rear of the car underneath the cabin, tipping the body of the car into a more upright position, compressing the length of the car into two-thirds that of the already tiny Smart ForTwo. There's only one door in the front of the car, meaning that passengers climb out through the windscreen. Though this is made easier by the car's upright, parked position. "I call this mobility on demand," says Ryan Chin, the MIT researcher behind the concept. "Hiriko's technology and green footprint is five times better than you find in today's Smart cars." Each wheel is driven independently by its own dedicated motor and also steered electrically which should allow it to be especially manoeuvrable. The driving experience could take some getting used to – though retro gamers and flight sim fans could have the edge – as the Hiriko's wheel has been replaced by a joystick. A test production run of 20 vehicles is happening at Vitoria-Gasteiz in the Basque country, with finished versions ready for the road expected in 2013. The project is getting €15m in grants from Madrid, each of which will cost €12,500 to build. To see the folding car in action, MIT's video is on hand to help you visualise the future.